It's been a busy week here at the Center for Global Development. On Tuesday we hosted the meeting of CGD's Board of Directors--an activity that would have normally been plenty of excitement for one week. In London today, Kofi Annan announced Joaquim Chissano, the former president of Mozambique, as the first winner of the largest award in the world--the Mo Ibrahim Prize for Achievement in African Leadership. The award consists of $5 million over 10 years and US$200,000 annually for life, as well as up to $200,000 a year for 10 years "towards the winner's public interest activities and good causes". President Chissano was praised for putting his country on a path towards peace and democracy and for a variety of economic reforms. The following post was first published on Nicholas Kristof’s New York Times blog, where Radelet, a CGD senior fellow, is one of several guest bloggers. Radelet lived for many years in Africa and Asia, taught at Harvard, and worked at the U.S. Treasury. He is currently serving as an economic advisor for President Ellen Johnson Sirleaf of Liberia. 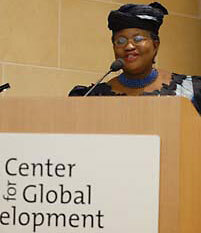 With my colleagues at the Center for Global Development, I extend hearty congratulations to Bob Zoellick for recruiting back to the World Bank Ngozi Okonjo-Iweala , the distinguished former minister of finance of Nigeria, as one of now three managing directors reporting to him. CGD supporters who don't know Dr. This year's decline in food aid [due to high food prices] follows a period when the sharply escalating costs of shipping American-grown food aid to Africa and Asia already reduced the tonnage supplied. The United States Government Accountability Office reported this year that the number of people being fed by American food aid had declined to 70 million in 2006 from 105 million in 2002, mainly because of rising transportation and logistical costs. At the first joint public appearance of the U.S. foreign assistance triumvirate this week, Henrietta Fore, acting director of foreign assistance and acting administrator of the U.S. Agency for International Development, John Danilovich, CEO of the Millennium Challenge Corporation, and Mark Dybul, U.S. global AIDS coordinator, argued U.S. Tomorrow will be a big day for U.S. foreign assistance reform. The day begins with a panel on "The Future of Foreign Assistance" at the annual conference of the U.S. Global Leadership Campaign and the Center for U.S. Global Leadership featuring the top three U.S. aid officials: Henrietta Fore, acting director of foreign assistance and acting administrator of the U.S.